When I was a kid growing up in New Jersey, just across the Hudson from New York, the best winter forecast to hear was one for snow — especially if it came with accumulations sufficient to close school and assure great sledding. Our street was a straight hill, and kids from all over the town would come to sled on it. Last week we had our second big snow of Winter here in Boston, and it was everything I love about winters in the Northeast. While it stopped traffic cold and closed schools all over the place, it was perfect for kids sledding and coating everything in white. Best of all, it was heaven for our kid, whose prior 11 years were spent in California towns where snow almost never falls — and who now goes to a school he loves, behind which are hills and fields perfect for sledding and winter play. Meanwhile, it rained in New York. Now I’m up early and watching the latest winter storm. Snow in abundance is streaking down through the cone of light under the street lamp in front of the house. About an inch is already added to the six or so that still cover the houses across the street, like thick icing on cakes. A mix of wintry precipitation this morning. Then periods of rain expected this afternoon. High near 35F. Winds E at 25 to 35 mph. 2 to 4 inches of snow expected. Winds could occasionally gust over 40 mph. 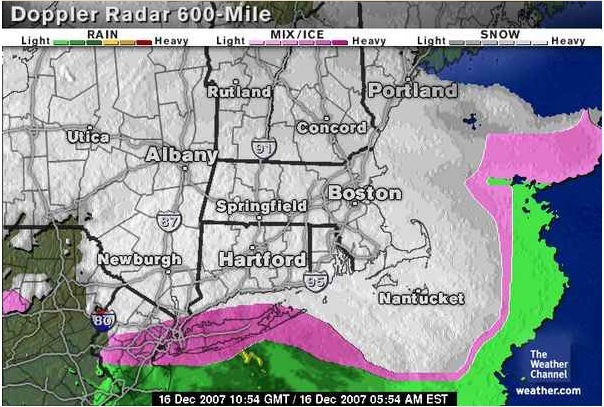 Meanwhile, the radar shows why Boston still beats New York for snowy winters. While Boston is still under white, New York is in a purple band between that white and a spread of green. The purple is ice. The green is rain. Here’s hoping both those bands keep to the south. [Later…] The snow turned to sleet, then hard rain. Now it’s all turning to slush. Awful. [Later still…] By evening everything paved was under thick and soupy slush. It rained far longer than it had snowed. When we got back from a concert in Cambridge, a snowplow had widened the road, forming a wall of slush-saturated former snow across the driveway. Shoveling that clear brought back no shortage of memories. But y’know what? It was good exercise, and I really didn’t mind. Would you mind if I link this in my kid articles? That would be great!!! Thanks, George. And sure. Go for it. Anything that’s good for kids is cool by me. And vice versa. So how did you fare, Russ? I’m guessing you’re not shoveling slush back in your town. Right now I’m getting ready to walk in 19° temps to the train station. Half a mile on slick mini mountain ranges of frozen slush and black-ice puddles.